The News Theme is one more classic Performancing WordPress theme. The theme intends to mimic the look and feel of a print magazine or newspaper, with paper-like upper and lower edges, which is quite suitable for blogs that want to put forth a newspaper-y type of image (aided by the display of the current date on the masthead). The color scheme uses subtle shades of grey and blue, with the sidebar standing out with orange tints. News Theme is a two-column theme with a horizontal navigation bar at the header, and space for details and links at the footer. This gives the site a clean look and feel, with a wide fixed-width main body and a sidebar wide enough to accommodate long link text or banners. The space on the header can also be used for horizontal banners. The theme was authored by Design Disease in cooperation with Performancing. Support is available at the Performancing theme support forum. You can see a live preview here. 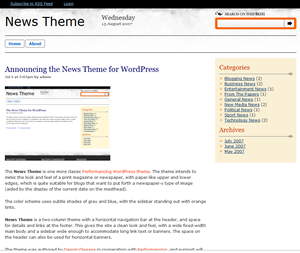 Update: News Theme has been updated for compatibility with WordPress 2.7 and up. Download the latest version here.